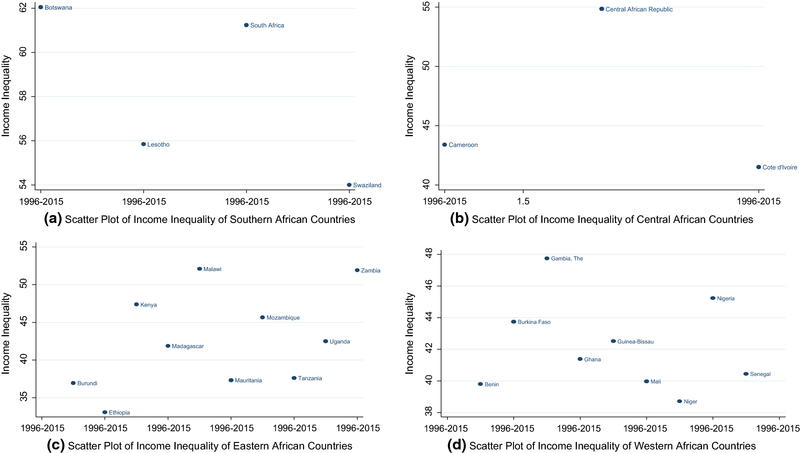 Ethnic Diversity and Inequality in Sub-Saharan Africa: Do Institutions Reduce the Noise? Studies on the causes of income differences between the rich and the poor have received an extensive attention in the inequality empirics. While ethnic diversity has also been identified as one of the fundamental causes of income inequality, the role of institutions as a mediating factor in the ethnicity-inequality nexus has not received the scholarly attention it deserves. To this end, this study complements the existing literature by investigating the extent to which institutional framework corrects the noisy influence originating from the nexus between “ethnic diversity” and inequality in 26 sub-Saharan African countries for the period 1996–2015. The empirical evidence is based on pooled OLS, fixed effects and system GMM estimators. The main findings reveal that the mediating influences of institutional settings are defective, thus making it extremely difficult to modulate the noisy impacts of ethno-linguistic and religious heterogeneity on inequality. In addition, the negative influences orchestrated by ethno-linguistic and religious diversities on inequality fail to attenuate the impact of income disparity even when interacted with institutions. On the policy front, institutional reforms tailored toward economic, political and institutional governances should be targeted. Ajide, K. B. & Alimi, O. Y. (2018). Political instability and migrants’ remittances into sub-Saharan Africa region. GeoJournal. https://doi.org/10.1007/s10708-018-9942-8. Asongu, S. A., & Nwachukwu, J. C., (2018). Comparative human development thresholds for absolute and relative pro-poor mobile banking in developing countries. Information Technology & People. https://doi.org/10.1108/itp-12-2015-0295. Asongu, S. A., & Odhiambo, N. M., (2018). Mobile banking usage, quality of growth, inequality and poverty in developing countries. Information Development. https://doi.org/10.1177/0266666917744006. Gosavi, A., (2017). Can mobile money help firms mitigate the problem of access to finance in Eastern sub-Saharan Africa. Journal of African Business. https://doi.org/10.1080/15228916.2017.1396791. Heinrich, A. (2009). National symbol, globalisation and the well-being of nations. MPRA Paper No 14882. http://mpra.ub.uni-muenchen.de/14882/. Liu, Q., & Lawell, C.-Y. C. L. (2015). The effects of innovation on income inequality in China. 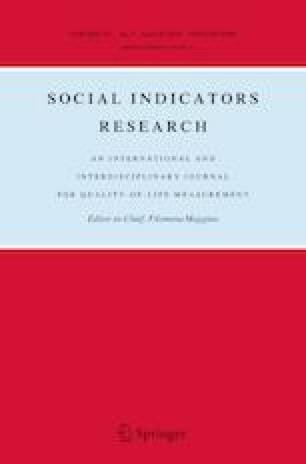 http://www.des.ucdavis.edu/faculty/Lin/China_innovation_inequality_paper.pdf. Mallaye, D., Yogo, T. U., & Timba, G. T. (2015). Oil rent and income inequality in developing economies: Are they friends or foes? Etudes et Documents, no. 02, CERDI. https://halshs.archives-ouvertes.fr/halshs-01100843/document. MinkouaNzie, J. R., Bidogeza, J. C., & Ngum, N. A. (2017). Mobile phone use, transaction costs, and price: Evidence from rural vegetable farmers in Cameroon. Journal of African Business, https://doi.org/10.1080/15228916.2017.1405704. Tchamyou, V. S. (2018). Education, lifelong learning, inequality and financial access: Evidence from African countries. Contemporary Social Science. https://doi.org/10.1080/21582041.2018.1433314. World Development Indicator (2016). World Bank Publication. Downloaded from https://openknowledge.worldbank.org/bitstream/handle/10986/23969/9781464806834.pdf. Downloaded on April 11, 2019.